A proposal is also called an offer; the term proposal is define in the section 2 sub-section “a” of the contract act 1872 says that ….. The person making the offer is called the offerer and the person to home the offer is made is called offeree. An offer may be express or implied. It may be made to a define person or a class of person or for all. It must be one which is capable of creating a legal relationship and obligation. The terms of it must be certain, define, unambiguous and not vague. A mere statement of intention is not offer. Primary negotiation is not an offer. Counter offer destroy the main offer and create a new offer. Ignorance of offer no creates any contractual right. An offer may be revoked before acceptance. An offer stands till a regional time. Standing offer is open for all time. An offer may be revoked by the any one of the flowing ways ……..
An offer may be revoked by the offerer before acceptance. After expiration of the satisfied time mention in the offer. In absence of any specified time minting in the offer, after expiration of a reasonable time. If the offerer died before acceptance. 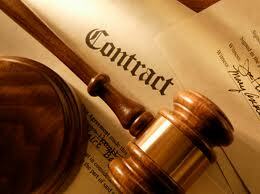 If the offerer fail to fulfill any pre-requirement condition of the offer. If the offer is not accepted by the offeree.